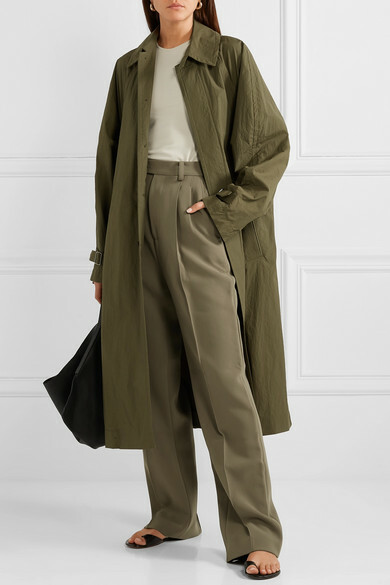 From the army-green color to the buckle-fastening cuff tabs, Deveaux's coat is right in line with the season's utilitarian trend. It's made from lightweight shell in a relaxed fit that's emphasized by a dramatic back vent and left unlined so it's perfect for layering. Slip it on over sharp tailoring or chunky sweaters. Shown here with: Peter Do Pants, Deveaux Tank, The Row Shoulder bag, The Row Sandals, Leigh Miller Earrings, Charlotte Chesnais Rings.